Recycling is good. You should do it. According to a 2010 report from the Environmental Protection Agency (EPA), America recycled and composted just over 85 million tons of municipal solid waste, which provided an annual benefit of more than 186 million metric tons of reduced CO2 emissions, comparable to the annual greenhouse gas emissions from over 36 million cars. Good for us! But here’s the thing: The amount of recycling that could be happening in America is pathetic, compared with what we’re currently doing. And it’s only gotten worse. Here’s the relevant chart from the EPA, showing the percentage of total municipal solid waste that gets recycled, in orange. After a big uptick in the late ‘80s we’ve slowed down considerably, and have basically been stuck at 34% since the recession. Thirty-four percent puts us at 18th in the developed world, according to Forbes. Not terrible — somehow Canada performs even worse — but there’s clearly a long way to go. And this just includes all recycling. The rate for the kind of recycling we are mostly familiar with, for beverage containers, actually declined between 1990 and 2010, according to the Container Recycling Institute (CRI). In 2010, Americans wasted (i.e., landfilled, incinerated, or littered) almost two out of every three beverage bottles and cans sold, CRI says. 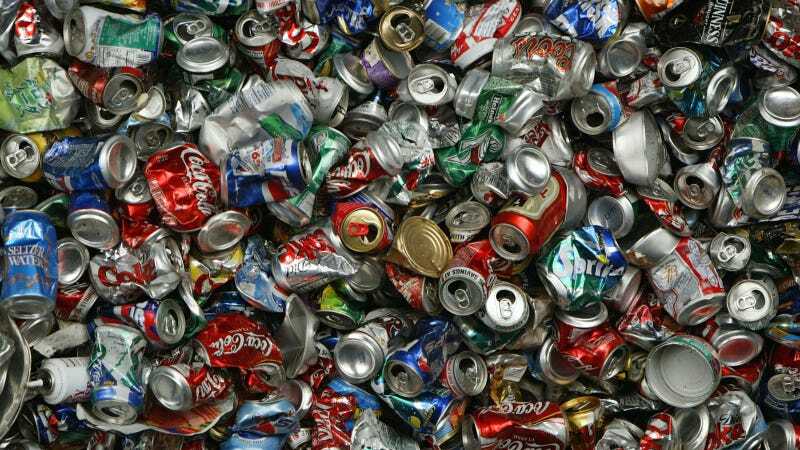 For aluminum cans alone, we landfilled, incinerated, or littered enough to reproduce the world’s entire commercial air fleet 25 times, according to the Institute. Between 2001 to 2010, the value of wasted beverage container materials exceeded $22 billion, the Institute says. A Pepsi rep confirmed to me in an email that its North American bottles and cans contain approximately just 10% of recycled content on average. Bridget Croke, a representative for the Closed Loop Fund, an initiative founded by beverage companies to improve their recycling stats, acknowledged that the currently available volumes of recyclable material are inadequate to allow beverage companies to make more of their products out of such material. “If we can increase the amount of material, and types of materials, recycled, these companies would then see increase in volume, and it would make it easier for them to purchase that material,” she told me. As a result, even if overall recycling rates were still increasing before the recession, they apparently had no impact on the overall amount of waste being generated, according to EPA data. This is relevant for places like New York City, which now aim to have zero waste. “The failure to recycle nearly two out of every three containers sold in the United States has monumental environmental impacts,” the Institute says, because they must be replaced in product stream with new containers made from virgin materials whose extraction and processing require more energy—and generate more pollutants—than making containers from recycled material. Nor is the burden being shared equally; there are specific regions of the country, like the South and Mountain West, that do little to no recycling whatsoever, according to a 2008 study by nonprofit group BioCycle and Columbia University. So, why have we stalled out? The most recent flatlining is partially due to the global economic slowdown — there is now less demand for raw materials, and as I’ve written previously, you need such demand to make local recycling programs profitable. But according to experts, the broader problem stems from the patchwork nature of recycling programs, which is the way it’s been since recycling first took off in the ‘70s. She pointed out that even San Francisco, Oakland, and Berkeley, all progressive bastions within minutes of each other, each have different recycling regimes. “If there’s little bits of material you’re getting from a lot of different places, it’s not super efficient,” Croke agreed. And what city and county efforts there are have been confounded by changing consumption habits that have put a premium on complex, single-serve containers, Hoover said. While that has put a dent in the overall mass of solid waste (namely, food waste), it ultimately means more and more packaging that is less recyclable. Municipal efforts to boost recycling rates have actually ended up adding to this problem. To alleviate the burden on residents of having to start all their recycling, many cities and counties have switched to “single stream” recycling, where all material gets deposited into a single container. But this also has the effect of reducing the overall amount of recyclable material available, Hoover said, since not all of it ends up getting properly sorted even in processing facilities. “You’ve traded off participation for value of material,” she said. For the CRI, the solution to both problems is easy. The states with the highest, most profitable recycling programs all have deposit-return systems—the programs that pay you $0.05 and $0.10 per bottle or can returned, currently found in just 11 states. There, CRI says, container recycling rates range between 66% and 96%. The institute estimates that if a 5-cent deposit rebate were placed on all carbonated and non-carbonated beverages throughout the United States, a 75% recycling rate would be achieved across the board. If the deposit were 10 cents or higher, 80%-90% recycling rates would be achieved. Such programs “can poll higher than motherhood and apple pie,” according to CRI head Susan Collins, but are opposed by food and beverage companies for the costs they impose. We could simply accept our waste problem and do things like build more waste-to-energy facilities, which convert treated refuse into electricity. These have already proliferated in Europe; as Fusion contributor Cole Rosengren has noted, Paris, Vienna, and Copenhagen all create significant portions of their district heating from incinerators located within city limits. But Collins told me not to despair and to continue recycling. Indeed, I spoke briefly with the head of the largest recycling center in North America, recently completed in Reno by Republic waste services, who said that despite the sluggish global economy they are still getting by with what is coming in. Collins did advise, though, that to truly change the tide and deliver the powerful climate benefits recycling can produce, we should start getting the ears of state legislators. “In the halls of power, the voices of people aren’t quite as loud as the voices of lobbyists,” she said.